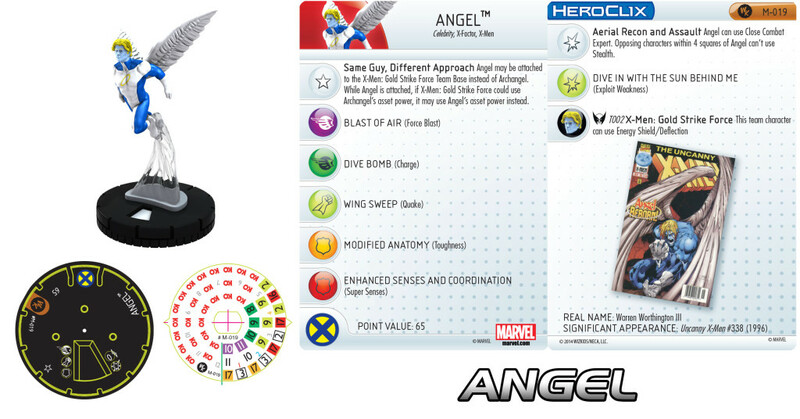 Wizkids has released a preview of the Angel miniature from the Marvel Heroclix: X-Men 2014 Monthly Organized Play kit. The kits feature 4 copies of 3 limited edition figures that you can’t find anywhere else and all three of the figures interact with the X-Men team base from the Marvel Heroclix: Wolverine and the X-Men set. Angel features not just a new dial, but also a sculpt unique to this play kit. The other two figures will feature sculpts previously released, but will have new dials. Angel is a cheap 65 points the figure can be used in the #T002 X-Men Gold Strike Force team base and when attached the figure may now use Energy Shield/Deflection. Angel is a quick support/attack character, carrying teammates around or using his move and attack ability with Hypersonic Speed. He also comes with Force Blast for the first two clicks. On the first two clicks of Angel’s damage slot he can dish out 3 clicks of damage to opposing characters. He also has Aerial Recon and Assault, which allows him use Close Combat Expert. Additionally, Aerial Recon and Assault lets the character help his teammates as well by by preventing opposing characters within 4 squares from using Stealth. Angel has the Toughness power to help him absorb some of the damage dealt to him. Once he’s off his first two clicks Angel gains Charge and picks up Quake in his attack slot. Defensively, Angel switches from Toughness to Super Senses. Aerial Recon and Assault sticks around on Angel’s third click, then is replaced with Exploit Weakness on his last two clicks. Basically Angel is a solid member of a team, especially an X-Men one since he has that team ability. Your force won’t be built around him, but he’s solid support acting as a taxi to get you to close the gap quicker or as a third attacker.